For day 47 we had our final day of vacation. We stayed in the Black Hills area, saw Mount Rushmore again, and went to one last National Park, Wind Cave (34 total). There is a tendancy for places to want to be the best or most of something. 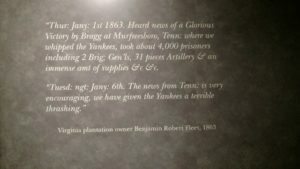 We saw this in the South where it seems like every battlefield claimed to either be the bloodiest battle in one way or another or to be the more decisive battle in one way or another. For Caves we were at Mammoth Cave a few weeks ago, which claimed to be the longest cave in the world. Other caves claim to be the first discovered or most visited. Wind Cave claims to be the most complex cave system in the world. I know there are mathematical formulas to describe the complexity of objects but, somehow, I doubt there is a precise formula to support this claim. The process by which caves are formed and the amazing diversity of life which has evolved to life in caves is very fascinating to me, but becoming an avid cave explorer is not on my to-do list. The most interesting thing to me is that Wind cave is a National Park both below ground for the cave, and above ground for the wildlife preserve with a large herd of bison and a huge Praire dog town. Both were fun to see on our way to and from the cave. We also just spent a relaxing day doing “vacation type things”, like shopping, taking pictures and finding a new and interesting place to eat. We accomplished all those things and decided to call in a fine day for an end to our vacation. I call it the end of the vacation even though we won’t be home for 3 more days. What’s left is just long distance driving back to our little home in the upper left hand corner of the map. Today we drove through our final state for our trip, Wyoming (19), and made almost 600 miles to Livingston, Montanta. About 800 miles more to get home. Tomorrow we will pass 9000 miles for the whole trip and yesterday we passed an oddity in terms of miles. The odometer briefly read as “123456”. Home soon but no more new states, new parks, cemeteries, museums or visits with people. Long day today. Out earlier than usual. 410 miles on one tank of gas at 50.1 mpg. 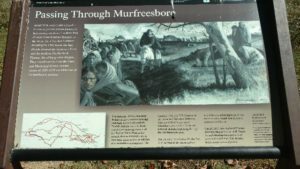 Started in Kentucky, then to Indiana and Illinois and almost to Missouri. We could see the arch for the Jefferson Expansion Memorial, otherwise known as the St Louis arch as we pulled into our hotel. Passed the 6000 mile mark for the trip today. 2 new national parks. Lincoln’s boyhood home in Indiana. This is where he grew up from a young boy of 9 to a young man of 18. I think this is the last of the Lincoln National Parks. We have previously been to the Lincoln Memorial in DC, to his summer White House in north DC, to his birth place, to the place he lived from ages 2 to 9, and to his home and his burial site in Springfield. Everything I learn about Lincoln just makes me admire him more. It is hard to imagine our country today if there had not been a Lincoln to lead at the time he became President. 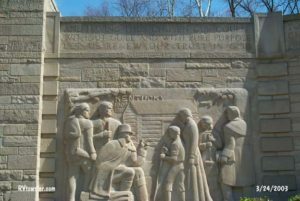 Then onto the other side of Indiana – Vincennes- and the George Rogers Clark National Memorial Park. This is a man almost forgotten to history who led the American effort to fight the British in the lands that were the western frontier of America in the late 1700’s. Everyone has studied the American revolutionary war and knows about George Washington, the Continental Congress, and the military actions in the East. 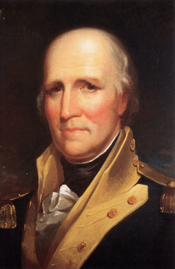 However, the actions of George Rogers Clark and the men who fought with him are all but forgotten. 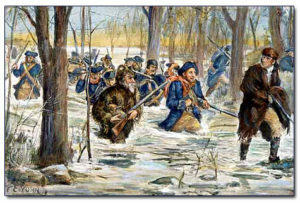 At one point he led 180 men through ice cold waters up to their waist and higher for several hours in order to make a surprise attack on a British held fort. As a result, when the war was over, the current day lands of Ohio, Indiana, Illinois, Michigan, Wisconsin and part of Minnesota, became part of the newly formed United States. He was only 26 when this occurred and lived into his 60’s in relative obscurity. Meanwhile his youngest brother, William, became famous as one of the leaders of the Lewis and Clark Expedition. We will see the site dedicated to the start of that expedition tomorrow. Today we traveled a few hundred miles south into Kentucky. Crossing the state line brought me into the 50 states club, as I have now been in all 50 states (plus DC) at least once. We added one new national park to our list, the William Howard Taft National Historic Site. 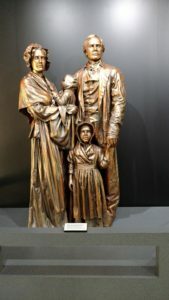 It is located at the house in Cincinnati where our nations 27th President was born and raised. He did not live there after leaving home for college because he spent his entire life as a public servant holding an amazing number of jobs in service of his country. He was a state judge, an Federal Appeals Justice, the person who got the Panama Canal project on track to completion, and the person who oversaw the organization of an system of government in the Philippines. He was also elected President of the United States, and later appointed to be Chief Justice of the United States Supreme Court. In the later position he helped modernize our judiciary to its present system. 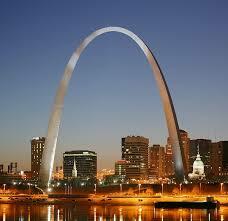 From there we moved on to Louisville, Kentucky to visit a street corner. 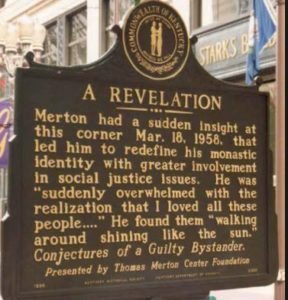 The corner of 4th and Walnut in downtown Louisville, now named 4th and Muhammad Ali Blvd, is the corner where the prolific author and spiritual prophet, Thomas Merton, had what he described as a mystical experience which changed his life. He was a brother at a Trappist monastery near here and had lived most of his life in solitude. But after this experience began to speak and write about his thoughts on a number of issues of his day, including civil rights, the Vietnam War, nuclear armament, etc. 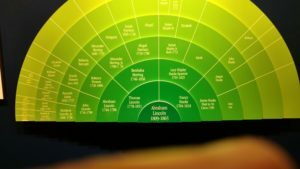 While not directly involved in any positon of power in the church or in society, his thoughts influenced many others who were. Then at the end of the day we made contact with one of Peg’s cousins who she has not seen in almost 40 years. It was amazing how easy it was for Peg and her cousin to just sit down and start talking about family and memories as if they had been getting together every year to catch up. I love these kinds of connections, and hope to connect again within a shorter time than the last gap.